Meet Nobody Owens. He hasn’t had a haircut in well, ever, his usual uniform is a gray winding sheet, and his best friends are a vampire named Silas and a long-dead girl named Liza. That’s because Nobody (or Bod for short) has been raised in graveyard with ghosts (Mr. and Mrs. Owens, to be specific) for parents and tombstones for playthings. When Bod was a toddler, an assassin known only as Jack crept into his house and murdered his entire family. While the monster was at his diabolical work, Bod quietly wandered out of his room and into the nearby graveyard. He was discovered by the Owenses, who decided to raise him themselves with the help of Silas, who could move about in human society and and secure food for the child. As Bod grows, he learns many useful things from his adopted family, like how to Fade, Dreamwalk, and make Fear, all the while knowing that the man who killed his family is still out there—and eventually he will have to face him. While the creepy quotient is not quite as high as Gaiman’s insta-classic Coraline, The Graveyard Book has a certain Burton-esque Nightmare Before Christmas quality that gives it an all-ages appeal. 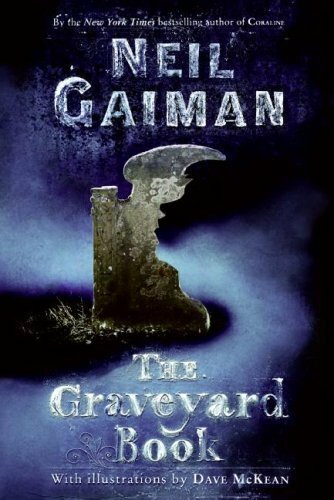 Both frightening and funny (and sometimes frighteningly funny) this latest supernatural goody from Master of Magic Gaiman is hopefully haunting a library or bookstore near you. Seventeen-year-old Jenna Fox has just woken up after being in a coma for a year. Disoriented and confused, she remembers nothing of the horrible car accident that caused her imposed sleep. Her parents are strangers, her memories full of holes. Gradually, she gets to know the Jenna of the past through the hundreds of hours of film her parents shot of their beloved only daughter. Who is that perfect smiling creature? Jenna can’t even begin to imagine knowing her, let alone being her. Slowly, she begins to reclaim her life by starting school again, making new friends, and sparking a romance with shy boy Ethan. But even as she plunges into her new life, she is plagued by questions about her old one. She used to be a ballerina. So why, after weeks of being out of bed, is her walk still so ungraceful? How is it that she is regaining memories she never even had her first time around—like her infant baptism? When Jenna gets a bad cut, she suddenly understands with hideous, perfect clarity exactly how far she has come from the girl she used to be to the person she is now. Pearson’s gradual revealing of Jenna’s true identity is masterful, as she teases readers with a shocking revelation that is just out of reach. Reminiscent of Eva by Peter Dickinson and Never Let Me Go by Kazuo Ishiguro, this bewitching, mysterious novel is a gripping examination of what it means to be human. Sometime in the near future, silvery parasitic aliens infiltrate the human population, bringing peace and love but causing their hosts’ personalities to be erased. Melanie Stryder is a seventeen-year-old post apocalyptic street fighter with a bad attitude who also happens to be stunningly gorgeous. Wanderer is a 1,000-year-old well-traveled female alien soul who, despite being parasitic, is altruistic to the point of martyrdom. The two of them are both attempting to occupy Melanie’s body and making a sorry hash of it. (Souls are surgically inserted into the base of the neck by doctors who have already been Body-Snatched.) Melanie is trying to keep the location of her small rebel human outpost a secret from her parasite, but eventually the soul breaks through and seeks out Melanie’s man, Jared, her little brother Jamie, and a rag tag assortment of other folks who have managed to evade having their brain stems coated with memory-wiping silver silly-putty. 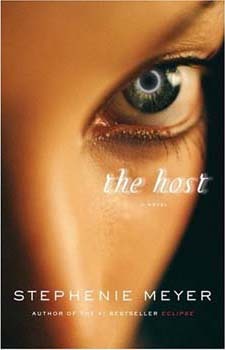 When Melanie’s body first shows up at the secret desert camp under the direction of Wanderer, the insurgent humans are all for murdering her on the spot, but Wanderer wins them over by giving voice to Melanie’s thoughts and discovering to her own surprise that she actually digs these passionate, violent, lusty life forms. Things get complicated when two of the men in camp both fall for the dystopian Sybil—Jared, Melanie’s hot, older-man savior-type, and Ian, a brooding bad boy who has lost his heart to the selfless Wanderer, who he calls “Wanda.” Sound familiar? It should–Meyer treads some of the same supernatural romantic love triangle ground she traveled so well in her enormously popular Twilight series. If you liked those books, you’re gonna love this one. Personally, Meyer’s melodramatic dialogue drove me a little nuts, but I did dig her descriptions of Wanderer’s past worlds, and the sympathetic alien’s fascination with this planet. Clocking in at over 600 pages, it’s also not going to be easy to stuff in your backpack. If you prefer your interspecies romances with a few less pages and a bit more grit, you may want to pick up a copy of the now classic Blood and Chocolate, one of my all time fav romantic horror stories, instead. In a San Francisco of the near future, seventeen-year-old Marcus Yallow is a master hacker with a monster grudge. When the San Fran Bay Bridge is blown to smithereens by terrorists, Marcus and three of his best friends are hauled away as suspects by the Department of Homeland Security. They are interrogated, beaten, and denied food—FOR DAYS–just for being in the vicinity of the blast. After finally convincing his captors he knows nothing about the bombs, Marcus is released after signing documents swearing he’ll tell no one about his terrifying experience. He goes home to parents who are so happy that he’s alive that they buy his story of being quarantined due to possible exposure to biological toxins. But the world is not the way he left it. His beloved hometown has turned into a place where 24/7 surveillance is the name of the game. Law-abiding citizens are routinely shaken down if they deviate from their usual patterns by one iota. The DHS treats everyone like a potential terrorist threat. But Marcus refuses to accept the new police state and instead hatches a radical plan to jam the government’s circuits and return power to the people once and for all! How he manages to pull that off is the basis for this amazing sci-fi novel by tech-blogger Cory Doctorow. Clearly influenced by the events of September 11, 2001, stories from Guantanamo Bay, the PATRIOT Act and George Orwell’s classic 1984, Doctorow gives us a frighteningly contemporary glimpse at how easily the government can take away our civil liberties under the guise of keeping us “safe.” Totally timely and full of fascinating techno-talk that even the Google-challenged can understand, Little Brother is a fast-paced, thought-provoking read that will leave you searching for your own way to “jam” the Man! Want to know how Marcus does some of his techno-tricks? Check out Doctorow’s LB blog or connect with him on MySpace or Facebook. In a fictional island kingdom off the Irish coast in the 1880’s, young Conor Broekhart leads a charmed life. As the beloved son of the head of King Nicholas’s sharpshooters, Conor is treated like royalty himself. He plays and plots with Princess Isabella, and learns self-defense and aeronautical design at the knee of the king’s best friend and Parisian scientist Victor Vigny. Together, they dream of creating the first heavier-than-air flying machine that will catapult man into the heavens. But all those dreams come to an abrupt end the day teenage Conor accidentally witnesses the double murder of his king and his adored tutor. Framed for the murders by the traitorous commander of the king’s army, Hugo Bonvilain, Conor is condemned to rot in an inescapable prison while his parents and Isabella are led to believe he is dead. At first, Conor wishes that were the case. But slowly, his resolve to escape grows until he fashions an outrageous plan that will either win his freedom or take his life. It is impossible to dig or swim your way off the prison island of Little Saltee. But if Conor’s plan works, he’ll just take to the air and fly…this historically flavored fantasy is pure white-knuckled pleasure from start to finish. Full swash-buckling swordplay, dizzying rescues from great heights and breathtaking escapes, Airman takes off quickly and lands with a satisfying thump. If you enjoy the adventures of Alex Rider, Matt Cruse, or even the clever machinations of Andy Dufresne, the brilliant hero of Stephen King’s Shawshank Redemption, then you’re going to want to book a flight with Conor Broekhart. High school senior Ruby finds herself in a precarious position when her alcoholic mom ditches her and she is left to fend for herself in the six months left before her eighteenth birthday. She tries making a go of it on her own, hiding the fact that the water and heat in her rented house have been turned off, but she is eventually found out and sent to live with her uber-successful lawyer sister Cora (who she hasn’t seen in years) and Cora’s technological whiz-kid husband Jamie. Being catapulted from skid row to the equivalent of VH1’s The Fabulous Life of… leaves Ruby suspicious and unwilling to believe that the good times will last. In fact, she still keeps the key to the old house around her neck just in case she needs an escape hatch. But as she begins to collect new friends who gently but insistently begin to demand her attention (bossy, cell-phone obsessed classmate Olivia, OCD-suffering boss Harriet, more-than-just-a neighbor and smokin’ hot Nate) Ruby begins to relax into her suddenly safe and spacious new life. Until she discovers that perfect Nate has some family secrets of his own, secrets that she unfortunately understands all too well. Can these two fiercely independent teens learn to lean on each other? Or will their pride keep them apart? Sarah Dessen maintains her signature deep and introspective style in this, her eighth novel, and fans will recognize some familiar characters from Dessen’s other works embedded in Ruby’s story. If you like Lock and Key, you’ll want to go back and read Dessen’s backlist, especially my favorite title of hers.